Most dental benefit plans have a yearly maximum that expires on December 31. Therefore, if you don’t use all of your allotted coverage by the end of the calendar year, you lose any leftover funds. Flexible spending accounts (FSAs) may also expire at the end of the year; you may forfeit any funds that aren’t used by the time 2019 begins. Don’t let your benefits go to waste! Contact our office, and an insurance expert will help you verify how much of your benefits remain. Then, we can schedule an appointment so you can make the most out of the funds you have left before the end of the year. Call us soon — our fall schedule is quickly filling up! You pay for your dental insurance premium throughout the year. The small amount that you and/or your employer gives to the policy provider allows you to have $1,000 - $1,500 in coverage. Some plans offer even more. By not completing any necessary treatment by the end of the year, you sacrifice your remaining benefits. It’s a “use it or lose it” situation. You should schedule treatment now to make sure you take the greatest advantage of your 2018 benefits. Many dental procedures take place across several appointments, so the sooner you plan your treatment, the more likely it is that you’ll be able to use all of your benefits before they expire. We’ll put our insurance knowledge to work so you can maximize your coverage and minimize your out-of-pocket costs. FSA funds don’t usually roll over to the following year. The funds that you or your employer contribute to the FSA throughout the year can be used for dental care. Don’t let that money expire! Most insurance companies cover preventive care, such as cleanings, X-rays, and exams, at 100%, with no out-of-pocket costs to their policy holders. However, these services still do count toward your yearly maximum. If you schedule your overdue routine care this year, you’ll have the entire amount of next year’s benefit available to help you pay for any advanced treatments you may need. A few plans have a “rollover period” that allows you to use remaining benefits at the beginning of the following year. However, it is usually a reduced amount that gets carried over. You’ll still forfeit the opportunity to truly get the most out of your insurance or FSA. Healthcare costs are significant for most families. 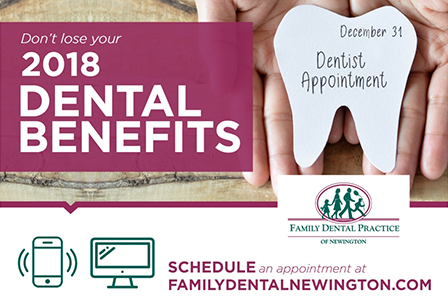 Schedule your dental appointment today so you can reduce the cost of your dental care and take full advantage of your benefits before they expire on 12/31/2018. Be sure to use any FSA or healthcare savings account (HSA) money that you have remaining. The end of the year will be here before you know it — book early and let us help you maximize your dental benefits. Our friendly staff members are always ready to verify your coverage, check how much of your benefits remain, and offer suggestions to help you keep your smile healthy with as little cost to you as possible. Let us help maximize your remaining 2018 insurance benefits! To request an appointment, fill out the form below. A member of our team will contact you shortly to confirm your request. If you need immediate assistance, or this is an emergency, please call the office.